As a kiteboarder, pumping up your kite(s) is often one of the worst chore – besides loading and unloading your car without leaving any equipment behind – you have to do before going out in the water. If you’re like me, you’re probably using an old beat up kite pump that’s become highly inefficient and needs replacement. But how do you choose a good kite pump that’ll make your life easier at the time of inflating your kites? Aren’t all kite pump more or less the same? Have pump manufacturers come up with better kite pumps since you bought your last one? Recently, I decided to replace my old kite pumps and so I researched the market for a little while. My final choice went to the WMFG 3.0T pump (Amazon page) because of the greatly-improved ergonomy and efficiency compared to traditional kite pumps. A close runner-up for me was the Ocean Rodeo Sports big pump, pretty close to the WMFG in terms of features and a bit more affordable, but not nearly as high-quality (e.g. hose and seals). A third alternative was a popular cheap but functional pump I could easily replace once it broke. As it turns ouy, I chose to invest in a solid quality pump (more on that below). So what makes a good kite pump? If you’re a newbie, you may think a pump is a pump and you can just use any universal pump for beach toys and air mattresses – simple, cheap, disposable. Most kiters, however, want an efficient pump that doesn’t require hours and physical exhaustion to inflate a kite – especially a bigger one. They also want a pump that will survive being blasted with sand in high winds, and one they don’t need to break their back over to do the pumping work. You also want your pump to have the right nozzle for your specific kite model, and a leash to hold on to the kite while inflating it in strong wind. High pumping efficiency thanks to a wide shaft and efficient air sealing. Wider shaft means more air is pumped on each stroke. About the last point above: most kite pumps will blow air into the bladder both when you push down and when you pull up the handle. As a result, pumping the kite gets harder as the bladder fills up and the pressure increases. The best pumps often have a knob for manually or automatically switching from double-action inflation to single action. So as your kite starts to fill up past a certain pressure point (e.g. 6 psi) and has taken its inflated shape, you can flip a lever, and now the pump only blows air when you’re pushing down, no longer when pulling back up. Some premium pumps will automatically switch to one-way pumping once you get past a specific pressure level, which you can set on the pump. This feature makes a big difference in your kite pumping experience, particularly when inflating a big kite! Now we know what makes a good kite pump, let’s go over the most common issues we get with our good old pumps. If you kite on a regular basis, you kite pump may last a couple of months to a year and a half before you have to toss it – you’ll often see dead pumps lying around trash bins at the most popular kite spots. Note that you can extend the life of your kite pump by lubing it on a regular basis, just unscrew the lid around the shaft, pull it out, and slap some grease round it – manufacturers use lithium grease. Generally speaking, however, kite pumps are typically not very durable. The ones sold by the leading kite brands tend to be better quality than aftermarket pumps. Most kite brands actually offer the same pump models made by one or two manufacturers – GRI China is one of them – and branded under their own names. While some kiters look for premium kite pumps that last longer (like the WMFG, see below) others prefer to treat kite pumps as a commodity and get a cheap pump (e.g. the Airhead) they’ll replace after a few months. Also, many argue an expensive pump is more likely to get stolen on the beach (personally, I tend to lock up my pump in the car before going out). So which philosophy you choose, expensive durable pump vs cheap disposable pump, is your call! Many kiters who suffer from back problems have a have time inflating their kites because the pumping movement puts strains on their lower back. I for one went through a serious lower back injury and was afraid I’d never be able to pump up a kite again. As it turns out, pumping my kites is a very beneficial exercise for my lower back. Not only does it give me a healthy warm up, it also helps strengthen my lower back muscles, provides an effective lower back stretch, and helps prevent injuries when done right. 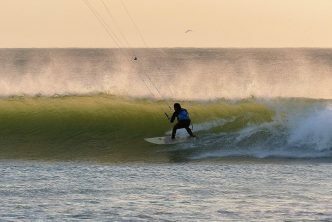 Check out my post about kiteboarding with back pain for more on this. In addition to using the right posture to pump up your kite, choosing a good ergonomic pump such as the newer, taller pumps will also help you reduce back strain and make things easier for you. Let’s look at the 3 of the best kite pumps I’ve found – and why I think they’re the best. WMFG has built a reputation for making high-quality and efficiency pumps. They came out with the first tall pump. 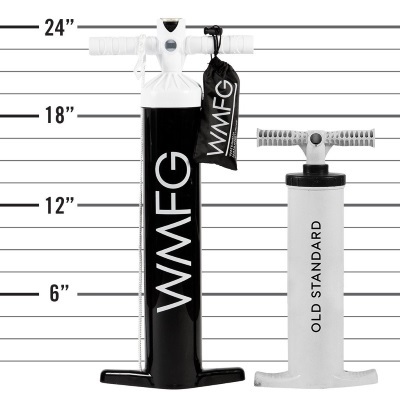 The WMFG 3.0T (Amazon) is the latest version of their high-volume, 24″ tall pump. The added height and volume make this pump much more efficient and comfortable compared with a standard pump. Your kite is filled faster and easier with way fewer strokes. As the kite fills, you don’t feel much increase in pressure at the handle – so be sure to check the gauge or do the ping test not to overinflate your bladder! Another important advantage of such a tall pump is the ergonomics: the increased height reduces the strain on your back and posterior leg muscles as you stand more upright. Though there are other good tall pumps on the market, the WFMG is one of the best due to the quality of its parts and the features it offers. Examples of quality parts are the high-tech seals that won’t dry up, and the quality metal shaft (not plastic which often breaks) that doesn’t heat up even with vigorous pumping – unlike many conventional pumps. The hose is also well-engineered, high-flow, rugged, and with special threaded fitting so it screws onto the pump and never comes off while you’re inflating – happens all the time with normal pumps. The hose is advertised as “mega-flex” – although in reality, it’s relatively stiff. A key feature of the WMFG 3.0T (and the previous 2.0T version) is the nice lever to set up the pump with the inflation only on the down stroke. Switching from double to single stroke lets you go from high-volume pumping, which works well with low-pressure in the kite, to low-volume (single stroke) which allows you to fill your kite all the way as the pressure rises. 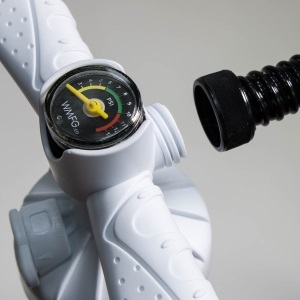 The WMFG has a quality integrated pressure gauge with a sand filter (essential for a kiteboarding use). If also comes with a set of nozzles to fit most kites on the market, including a quality threaded Boston nozzle. Of course, no pump is perfect. The WMFG is taller so it won’t fit in your kite bag – you have to strap it on. No biggie though. Also as mentioned, the rugged hose is a bit stiff, making it a bit of a hassle to store. An easy solution is just to unscrew the hose from the pump for storing, the hose will lay nice and flat. Even though the WMFG is faster and easier to pump, some female riders complain the WMFG still requires strength to pump a kite all the way to 8 psi. Also, on a tall pump, you use your arms more as you can’t lean onto the handle as much, and “dead-lift” back up like with a short pump. Another thing is, if you’re a person with short arms, you may not be able to easily go the full stroke, stopping at mid-chest and not pushing all the way down. Even so, however, the WMFG still pumps much faster than a regular pump. The kite end of the hose uses a fixed screw attachement which is a bit of a pain as the hose can twist itself of the bayonet kite fiiting unless you twist the hose yourself. A floating type of attachment would be a better option. As mentioned at the start of this article, before I decided to bite the bullet and fork out the $90 for a high-end WMFG, I checked out a bunch of pumps on the market. One that caught my attention was the Ocean Rodeo big pump, a more affordable choice at around 2/3 of the price of the WMFG. The Ocean Rodeo is a tall pump as well, and has a 2.9L stroke chamber comparable with the WMFG. It has an integrated gauge, a single-to-double action option, and several fittings to match various kite brands. It does the job well, pumps quite fast and efficiently, and has a good sturdy build. One caveat is that the hose is very rigid (though durable) and keeps coming off the kite. You can’t easily replace it with some other hose – this results in significant air leaks. Also, the seals and parts are not nearly as durable as the WMFG – which makes a big difference for me. Overall, though, this Ocean Rodeo branded pump is a very decent pump for the money. A good choice if you’re on a tighter budget and want an efficient tall pump that will cut your kite inflation time. Some riders are not willing to invest in a premium pump. If that’s your case, you can go with this cheap but usable Airhead Kwik-Tek AHP-1 pump (Amazon). Not a tall pump, no brand name, but this pump does have a knob for switching from double action (faster but harder) to single (slower but easier). The pump does the job quite well. It has an efficient seal with no air waste and pumps faster than most regular pumps. 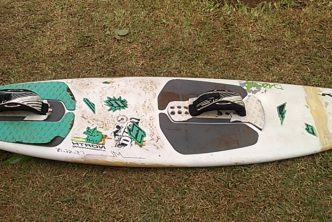 Kiteboarding users are generally very happy with it given the low price. Some feel the Airhead works better than expensive brand name pumps. They particularly appreciate the one-way pump (single action) setting. Their main quirk is the absence of tether for the kite – but it’s quite easy to improvise one. The Airhead Kwik-Tek looks relatively sturdy, although it does use cheap material and doesn’t carry a warranty. By choosing this pump, though, you save $40 to $70, so you can afford to replace it when it does break. That can be a reasonable alternative to a high-end pump in my opinion. Some kite schools actually use this pump, though they replace them often. 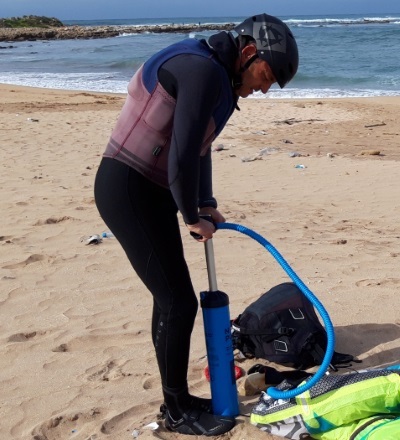 Not everyone wants an electric pump for inflating kites – I personally prefer manual pumps because pumping my kite helps me stretch and warm up (see earlier section). Also, I don’t like to have to manage another battery and I’m reluctant to make noise on the beach. Generally speaking, I prefer less technology and more body work. That being said, you can save a lot of time with an electric pump, and you can even help others inflate their kites with little effort. If you have a really bad back and aren’t able to do the pumping moves to your advantage, then you may be better off with an e-pump. If I were to choose an electric pump for my kites, I would certainly pick the Scoprega Bravo 20 electric pump (Amazon page). It weighs around 10 pounds and its battery gives you roughly 30 minutes of pumping time, allowing you to inflate quite a few kites for you and your buddies on the beach. The pumping starts a bit slow but then picks up after a short moment. It auto shuts off when it reaches a given psi that you preset, removing the risk of blowing up your bladder. 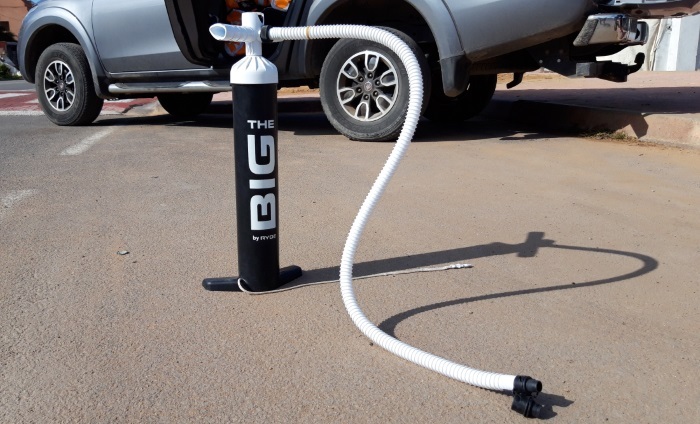 The e-pump works with just about every kite from all big brands on the market as it comes with many different nozzles and adapters – it can also be used to inflate SUP. It has a heavy duty, longer than average hose. This Bravo 20 has quite a few battery charging options, including using any 12-volt battery such as your car battery. Obviously you can also charge it at home. It takes about 8 hours to fully charge. The pump and all its adapters come neatly packed in a nice, easy-to-carry padded bag with zipper compartments. So what kind of kiteboarder are you when it comes to kite pumps? A skilled pumper willing to invest in the most efficient and durable pump out there? A throw-away pumper who will choose the cheapest pump, use it to the best, then toss and replace it? Or, a lazy pumper who relies on electric technology to handle this kind of chore? Whichever your type, be sure to maintain your pump, lube it, clean it, remove the sand from it. You’ll get more mileage from your kite pump.